This page explains the concepts of our therapy. If you want to know more about a particular disorder, check the Parkinson, Essential Tremor or Neuropathic Pain pages. These concepts are based on years of experience in the field published in the international litterature. 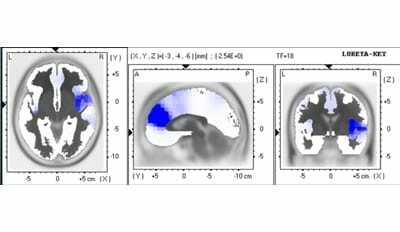 The brain maps of the atlas of Dr. Morel (Multiarchitectonic Stereotactic Three-dimensional Atlas of the Human Thalamus and Basal Ganglia) allows high-precision localization of selected millimeter-large target areas in the brain. 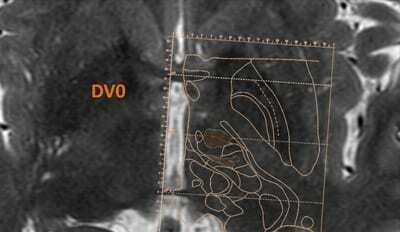 Superposition of an MR axial scan with an atlas map on the vertical “zero” position. There is accumulating evidence that the brain functions as an oscillating coherent generator. The most important partners are the cortical areas and the thalamus, which is a nucleus, or cell group, in the middle of the brain hemisphere. There are numerous (many billions) recurrent connections (or loops) from thalamus to cortex and back as well as between cortical areas. This complex organization may be compared to an orchestra, with the thalamus in the middle as conductor and the cortical areas distributed around as the players. Every sector of this orchestra, sensory, motor and mental (cognitive/emotional), has a dual organization, with tightly organized executing and diffusely organized modulating components. This thalamocortical system, or network, possesses the neuronal anatomo-physiological organization to function as a coherent oscillator. It could in addition harbour complex non-linear, chaotic, or even quantum-physical properties. The neurophysiological research of the last 30 years brought indeed strong evidence that every brain function correlates with the production of an adequate rhythmicity. This rhythmicity has as basis the neuronal loop which connects reciprocally corresponding parts of the thalamus and cortex, the so-called thalamocortical loop. Brain rhythms can be divided in high (between 13 and 100 Hz) and low frequencies (between 1 and 13 Hz). Sleep correlates with low frequencies, whereas sensorimotor and mental activities during wakefulness make use of all, low and high frequency domains. The work of Prof. Llinas, at New York University, has greatly contributed, over the last 30 years, to these neurophysiological developments. The term thalamocortical dysrhythmia (TCD) was coined by Prof. Rodolfo Llinas and describes the basic physiological mechanism of functional brain disorders. The developments in this field were primarily conditioned by: 1) the discovery by Llinas and co-workers of the low threshold calcium spike bursts in the early 80’s, 2) the studies performed by them since the 90’s on the normal physiology of the thalamocortical network, and 3) the joining of efforts of this group and of the team of Prof. Jeanmonod since 1998. This close and fruitful collaboration goes on until today, and Prof. Jeanmonod considers Rodolfo Llinas as his neurophysiological mentor and dearest friend. TCD consists in the overproduction of low (1-13 Hz) and high (13-100 Hz) frequency activities between thalamus and cortex, which have been examined in last years thanks to microelectrode single cell recordings in the thalamus during interventions, and are recorded today using non-invasive quantitative electroencephalography (EEG) and magnetoencephalography (MEG). We use a 64 channel EEG recording system with algorithms for spectral power and source localization. The TCD represents the common basic mechanism at the source of the most different clinical manifestations found in neurogenic pain and tinnitus, movement and neuropsychiatric disorders as well as epilepsy. As in the image of the orchestra, the conductor (the thalamus) is at the source of a basic distortion, which induces the orchestra to overplay in one affected sector. This mechanism is common to all disorders, and the different clinical manifestations correlate with the triggering of the TCD process in corresponding thalamocortical sectors, which sustain either motor, sensory, or mental functions. For example, neurogenic pain can be explained as the result of an overactivity in the pain sector, tremor as the result of the same overactivity in the motor sector. A causal anomaly, e.g. amputation, produces a desactivation of pain-related thalamic cells, which causes them to increase their low frequency discharges. In Parkinson’s disease, thalamic cells are overinhibited, which for them is exactly the same as being desactivated (cell membrane hyperpolarization). The tight coupling between thalamus and cortex causes cortical areas to overshoot on low frequencies. An increase of this tendency develops in various areas of the brain hemisphere through the mechanism of coherence. This correlates with the appearance of negative symptoms, e.g. akinesia (lack of movement), cognitive deficits, reduced body sensation, or reduced hearing. 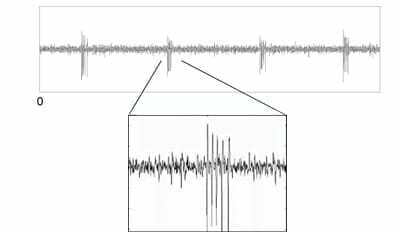 The low frequency overproduction causes an increase of high frequency activity, which is at the source of the appearance of the different positive symptoms, e.g. tremor, pain, tinnitus, hallucination and epileptic fit. When the TCD becomes chronic, severe and therapy-resistant and the clinical and EEG diagnosis is clear, an intervention may be considered. We have developed over the last 20 years a retuning and sparing, minimally up to non-invasive interventional strategy. This one is based fully on the pathophysiological mechanism described here (see Brain Storm) and thus centered on the necessity to reduce/normalize the overproduction of thalamocortical low and high frequencies without reduction of functional thalamocortical loops. In accordance with this goal, we could reactualize/refine already known targets and in addition develop and apply new ones. They can be globally described as selective retuning miniablations (SRMA). These millimeter-large ablations target dysfunctional, i.e. TCD-promoting, modulators in and around the thalamus, which in the process have lost their normal functions. An ablation in such an area, which leaves intact all remaining thalamocortical executors and all functional thalamocortical modulators, provides symptom relief and brings no deficit with it, reducing the TCD without risk for postoperative symptom increase. This is obtained by either a reduction of the low frequency overshoot, or by a reduction of thalamic overinhibition. Over the last 20 years, a detailed analysis of postoperative results of more than 1000 targets could confirm that this interventional strategy is indeed efficient but also sparing for sensory, motor and mental functions. The thalamocortical dysrhythmic (TCD) concept allows, and the clinical context demands, an in-depth integration of the psycho-emotional (or ideo-affective) dimension into the therapeutic process. The activation and optimization of self-healing mechanisms is directly related to this. There is clear evidence for the existence of two sources for the TCD process, that is 1) an anomaly in body or brain, and 2) intense and on-going mental activities, that is ideas and representations as well as their associated feelings. These can be activated by the presence of a chronic disease state and related suffering, but also by personal biographic factors and personality/character traits. Our experience indicates clearly that surgery can provide control of the disease- and emotion-related TCD, and brings in addition, indirectly and logically, a mental improvement due to the obtained symptom reduction. These therapeutic effects can however not take place if a counterproductive mental dynamics contributes to the suffering and has not yet been addressed and solved by adapted psychotherapeutic measures. This is most probably explained by the widespread and bilateral distribution of the thalamocortical paralimbic/associative network that is responsible for mental functions (in short called here the ”emotional brain”), as well as by its extensive interconnectivity with the other, sensory and motor, sectors. This provides the emotional brain with an outspoken, potentially dominant, strength. In other words: the mind of the patient is stronger than the intervention and the surgeon. This is surely an essential observation, which supports fully our integrative therapeutic approach. This one couples intervention and psychotherapy to cover both the somatic, or body-related, and mental dimensions, respectively. This discussion addresses also the important observation, often not considered in our materialistic and linear medical cultural context, that a human being may suffer from intense neurological symptoms originating from both sources, somatic and/or mental. This clearly points to the necessity of an integration of both therapeutic dimensions. The experimental evidence arises in recent times that mental, especially emotional activity can lead in the brain not only to a TCD but also to cell losses through different mechanisms. This strength of emotions has been demonstrated since years in impressive ways in different ethnological studies, showing that a belief can lead to body damages and even death. This points to a big responsibility toward our brain: our ideas, representations and beliefs can activate damaging processes. We can however also trigger and favour beliefs and emotions which lead to brain health and an activation of our strongly underestimated self-healing possibilities. The expectation of an improvement causes emotional tension, particularly when the symptom relief has been wished for intensively and for long time, and when there is a strong wish for the rekindling of different activities and capacities. A fear of symptom recurrence may develop during the first postoperative days in parallel with the joy about obtained improvements. The symptom relief liberates the mind, which can now get busy with, and disturbed by unresolved biographic issues and themes. The new symptom-free situation submerges the patients with fear due to loss of the long standing disease-related references. There rises a frustration activated by the time loss and the limitations brought by the disease. After years of chronic suffering, months up to years may be necessary till an emotional stability can be fully reinstated. High-tech activities are perfectly compatible with psychological and holistic approaches. Relevant prerequisites for an efficient team activity around the patient are a sufficient amount of integration of their own emotions by team members, empathy as well as trust in the patient’s self-healing abilities. We have collected along the years most positive experiences with such an approach, which seems to be particularly adapted to, and required by our patients suffering from chronic functional brain disorders. We could observe impressive symptom reductions after a few months of psychotherapy. These experiences as well as the existence of a common mechanism for both disease and mental phenomena, namely brain rhythms, lead us to the conclusion that our integrative therapeutic approach has solid ground and stems neither from an a priori nor from fashion. The world première-project “High energy transcranial MR-guided focused ultrasound (TcMRgFUS) therapy in functional neurosurgery” was developed in close collaboration with InSightec, Ltd and was supported by the Swiss National Research Foundation (NCCR CO-ME), the University of Zürich, the ETH Zürich and the University Children’s Hospital Zürich. It was lead by Prof. Jeanmonod in collaboration with the MR-Center of the University Children’s hospital (Prof. E. Martin), began in September 2008, ended in June 2009, and demonstrated the feasibility, reproducibility, safety, precision and efficiency of the TcMRgFUS. The second study was supported by InSightec Ltd, Rodiag AG, Privatklinik Obach and GE Healthcare Switzerland. 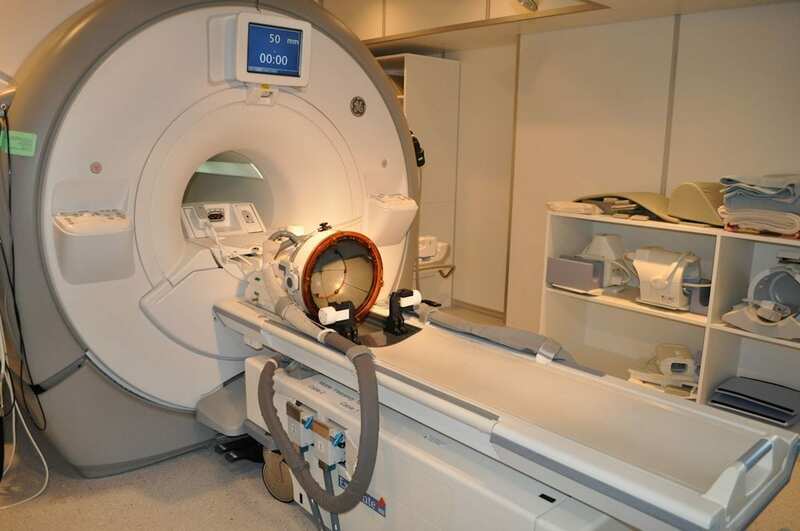 It took place between April 2011 and December 2012 in the Center for Ultrasound Functional Neurosurgery in Solothurn and demonstrated a 0.5 mm mean targeting acuracy of the ExAblate Neuro TcMRgFUS brain system. Patients with Neuropathic pain, Parkinson’s disease and essential tremor were treated without complications. TcMRgFUS allows to ablate with heating, with a millimeter precision, any chosen target area in and around the thalamus without skin incision nor skull opening. This allows a suppression of all risks related to skull and brain penetration. Focused means that 1024 ultrasound waves, each of them innocuous for brain tissue, converge in the target, where sonic energy gets transformed in thermal energy in an area of only 3-4 mm diameter with sharp borders. The desired temperatures are between 53 and 60 degrees Celsius, and the obtained target temperature increase is checked every 3-4 seconds thanks to MR-thermometry. This allows a most important, continuous control of the realized work in the target, and forbids the production of an unseen and undesired thermal increase beyond the target. This procedure provides the patient with an optimization of precision and safety. Data have pointed to the necessity of maintaining the temperature rise below 60 degrees Celsius. This allows to reduce effects on small vessels in the target, providing an optimal bleeding risk reduction. The procedure is performed without general anesthesia and consists of the fixation of a ring around the patient’s head under local anesthesia, the installation in the MR machine, calibration and targeting pre-treatment MR series, and finally the therapeutic application of focused ultrasound, in close contact with and under supervision of the clinician.